Alum’s Folding E-Bike: Will It Change Your Commute? Many of us have been in the situation—you want to commute to work, but your local transit solutions don’t quite connect you from your home to office. There are a couple of miles between the stop and your destination. Who has time for a two-mile hike when you’re in a hurry? You give up and just get in your car and drive there. Transportation Design alum Gabriel Wartofsky has a solution to this common problem: the folding electric bicycle. This sustainable personal mobility solution—which has the potential to help shape the future of commuting—is part of a system Wartofsky designed while a student at Art Center. This lightweight folding e-bike, manufactured from recycled aluminum by smelters using hydro power in the U.S., is only a part of an integrated system that requires integration with futuristic thinking bus, rail and auto transportation manufacturers—many of whom are lead by Art Center alumni. Director of Advanced Mobility Research at Art Center Geoff Wardle—the first advisory board member for Wartofsky’s newly formed Conscious Commuter Corporation—says that his product is the secret to solving the first- and last-mile commute problem. 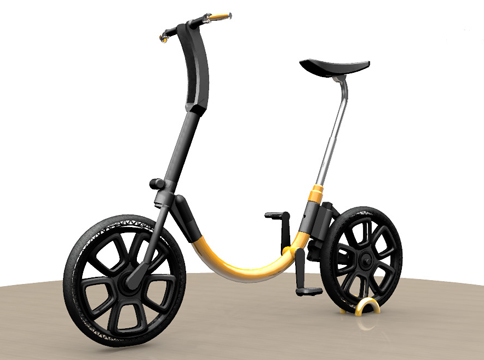 Wartofsky’s folding e-bike is currently in prototype development, and a prototype is planned for display at an upcoming Transportation Design event at Art Center in September. He’s currently looking for strategic, go-to-market relationships with auto, rail and bus manufacturers—any businesses or individuals interested in assisting with the project can connect with him at gabriel.wartofsky@consciouscommuter.com. Wait a second here. How do the pedals connect to the rear axle? That mysterious telescope pencil thin rod can’t be strong enough, and there is no gearbox for a shaft drive anyway! This looks like typical ACCD flash no function. Who are we kidding here? I feel hogwashed! Let’s get practical. Interesting design…I’ve been thinking about a folding E-bike for some time, but I think I might just get an electric conversion kit for my Montague folding bike. Looks great Gabriel, nice work. Oh, and for lekfx, remember that in the article it says the prototype is in development. Don’t you think things like the rear axle and drivetrain would be resolved by then? I’m sure all your pencil sketches come out perfect every time! Pingback: Art Center Stories: Gabriel Wartofsky « Dotted Line | Official Blog of Art Center College of Design | Pasadena, CA | Learn to Create. Influence Change. @lekfx- this animation reflects the initial concept of the idea- an you’re right, there are aspects of this animation that take artistic license; however, it’s the idea that got this company started. We are developing the first prototype from this initial idea, making necessary design changes whilst maintaining the concept’s spirit, and we’re aiming to present the first-phase prototype at the ACCD Advanced Mobility Panel Discussion later this year- please come and see the progress! Thank you Fred03….well pointed out! lekfx…. really? Get over yourself and go design your own Ebike then? Im feeling a little bitterness in your words perhaps?? ?